06, April 2016: An Ex-student of the University of Texas, Brownsville, Subho Chakraborty, last week officially published his personal story of the racial discrimination, hazing and assault, he experienced during his time at the University. Now a victim of Post Traumatic Stress Disorder, Chakraborty felt it was extremely important to throw light on the abuses and untoward events that are often swept under the carpet by US Universities, in order to preserve their reputations. 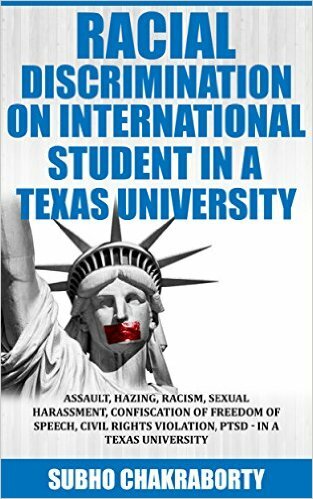 The Kindle edition of Chakraborty’s book, titled “Racial Discrimination on International Student in Texas University” is now available on Amazon for onlyR.66. During his time at the University of Texas, Chakraborty experienced severe racial discrimination, hazing and assault, and now is a victim of Post Traumatic Stress Disorder. He feels it is extremely important to throw light on the abuses and untoward events, and hence penned down the gruesome story of his trauma. The objective of publishing the book is to alert Indian students and the general public about the untoward incidences of racial discrimination that one may have to face in a US university. Subho Chakraborty condemns any kind of institutional racial discrimination in any part of the world and has started coming out, in order to help protect his freedom of speech and civil rights of students around the world. His book has several shocking and thought-provoking facts for concerned students and citizens to ponder upon. One can access the Kindle edition of his book at: http://www.amazon.in/Racial-Discrimination-International-Student-University-ebook/dp/B01DI4MJBC/ref=sr_1_fkmr0_1?ie=UTF8&qid=1459741052&sr=8-1-fkmr0&keywords=racial+discrimination+on+tnternational+student+in+texas+university .